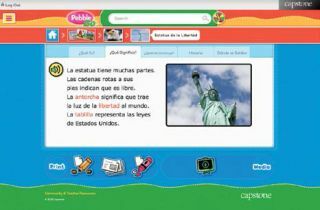 Capstone is pleased to announce its most popular PebbleGo databases are now available in Spanish. Three new modules PebbleGo Biografías (Biographies), Ciencia (Science), and Estudios Sociales (Social Studies) have been added to the database. All of the modules include Spanish text and read-aloud Spanish-language audio recorded by professional voice-over artists, and a content map that matches the English language version. The databases were created with authentic Spanish text and audio to ensure quality content. Carolina Science Online launched a suite of digital education tools and content to enhance the effectiveness of Carolina’s curriculum resources. Teachers and students can access CSO to utilize digital resources and teaching tools designed to supplement Carolina’s curriculum products such as Building Blocks of Science 3D K-5 science curriculum. Users can enjoy phenomena videos, interactive simulations, eBooks, formative assessments, and more. Teachers can also develop assignments via CSO resources, including PDF/Word documents and images. Jackson Charitable Foundation and Discovery Education announced the second annual Cha-Ching Money Smart Kids Contest! The contest invites elementary school teachers and families to take a pledge to teach kids how to “earn, save, spend and donate” for a chance to win $10,000 for their local school – plus an additional $1,000 for the charity of their choice. Entrants may participate once a day for their school from now through December 13, 2018. Edgenuity and Purpose Prep have collaborated to make the benefits of social and emotional learning available to students by offering schools and districts access to three new social and emotional learning courses: Personal Development, Character and Leadership Development, and College and Career Readiness. Each course is aligned to core competencies outlined by the Collaborative for Academic, Social, and Emotional Learning (CASEL) and designed to provide students with a deeper understanding of their own personal development. FreshGrade announces its Professional Learning Center. Designed to give teachers flexibility with their professional development, the Center offers online webinars, modular courses, and customizable PD options to streamline educators’ FreshGrade’s practice. The expansive toolbox of resources in the Professional Learning Center can be accessed on any device and features a mass-enrollment option for easy implementation for principals and teachers. Webinars cover topics such as portfolios, using FreshGrade in an ESL/ELL classroom, and more. GoGuardian announced Beacon, a suicide prevention tool developed in collaboration with suicide prevention experts, including the American Foundation for Suicide Prevention and the American Association of Suicidology. Beacon can monitor, assess, and alert based on what’s actively happening across students’ PCs in real-time, providing schools with immediate and actionable information. Schools can tailor Beacon to complement their existing suicide prevention protocols, notifying designated staff and parents so they are equipped to take quick action. PaperCut, an innovative print management software provider that allows users to track, control, and enable more thoughtful printing, announced it has joined the Google for Education Partner Program as a Premier Partner. The Google for Education Partner Program was designed to enable partners to sell, service, and innovate by leveraging the G Suite platform and products. This collaboration will deliver cutting-edge printing solutions for G Suite and Chromebook users. IM Certified Professional Learning, from Illustrative Mathematics, is developed, certified, and continuously refined by the authors of the IM 6–8 Math curriculum. Through IM Certified Professional Learning, educators develop the skills and confidence to implement standards-aligned instruction, ensure curricular coherence within and across grade levels, facilitate meaningful mathematics discussions, and implement instructional routines that engage students and improve their learning. LEGO Education announces Coding Express, the newest early learning solution in its hands-on LEGO learning portfolio. Coding Express is an intuitive and versatile solution based on a LEGO DUPLO brick train set that comes to life when children use the five new action bricks. The concept builds foundational coding and transferable skills, including collaboration and problem solving, for the youngest learners through activities that introduce concepts of sequencing, looping and more. PBS and WGBH unveiled the new PBS LearningMedia website, making thousands of digital resources more accessible to educators and students across the country. After hearing from hundreds of teachers, the new site features now include simple browsing by curriculum area, state/national standards and grade; improved search functionality; a refreshed look and easier access to local PBS station resources, including science programs and documentaries, news and public affairs, history and the arts, and more. SiLAS is a curriculum & software that allows students to role play social situations using video game controllers and microphones to control 3D avatars in a virtual environment. Students can be paired up, you can set up small groups, or work collaboratively with a teacher or an instructional aide. SiLAS records the virtual interaction in real-time, produces a studio-quality animation that teachers and students can watch and share, critique, and assess. Student-performance data can be tracked by teachers, with charts that show improvement over time. Animations are saved in guardian accounts allowing for year-to-year carryover, or use outside the classroom with families if you so desire. Sonic Foundry, Inc. announces new search and translation features in Mediasite Video Platform. Mediasite extracts keywords from anything said or shown in PowerPoint slides, screencasts, handwriting, and more, and that metadata is used for returning search results. Speech-to-text integration gives Mediasite full content search for everything said and shown in many languages, automatically indexing it without manually adding tags. Additionally, it will automatically remove interjections, vocal pauses and filler words to create cleaner transcript. Vivi announced its entry into the U.S. edtech market. Vivi’s classroom management solution system sets teachers free to roam the classroom and interact with students, allowing for immediate teacher and peer feedback. In addition to its core functionality of screen mirroring and video streaming, Vivi brings a slew of additional educational features including emergency broadcasting under the control of a single, easy-to-use app and institutional management through an admin portal. Sphero (www.sphero.com) announced the launch of BOLT, a robotic ball with play and coding capabilities through the Sphero EDU app, that introduces five new, interactive features, including an animated and programmable 8-by-8 LED matrix displaying real-time data and graphics infrared sensors enabling BOLT-to-BOLT communications; new games and advanced movements; extended battery-life (2+ hours); one-touch auto aim & a built-in compass; and ambient light sensors for new learning opportunities through light exposure. NEC Display Solutions (www.nec.com) announced its new F-Series indoor fine pitch direct view LED (dvLED) and Q-Series indoor and outdoor dvLED panels that offer customers a video wall solution. The F-Series offers a bright, 16:9 aspect ratio dvLED panel with a pixel pitch from as low as 1.2mm for indoor use. The Q-Series dvLED features a 1:1 aspect ratio panel and a wider pixel pitch starting at 2.84mm to produce seamless images. Epson (epson.com/usa) is shipping its compact PowerLite L-Series laser projectors within the 4,500 – 6,000 lumen range. They are versatile for convenient portability and installation in educational institutions with high ambient lighting. The projectors provide enhanced wireless display technology, letting teachers connect the projector to up to 50 Chromebooks, PCs, Mac computers, iOS and Android devices. Educators can also simultaneously display up to four screens with the Epson iProjection wireless display solution.